Bennies Fifties imports jukeboxes, decorationpieces and collectors items from the U.S.A., original diner furniture, neons, traffic lights, gaspumps, classic fans, vinyl records, rock & roll clothing, various collectibles and gift items. For over 40 years Bennies Fifties is a established name in the world of jukeboxes, fifties collectibles and memorabilia. It's fun shopping in the 500 m2 showroom, situated in the 'always' sunny Scheveningen. You really taking a step back in time when you walk through the door. It's a crazy, stacked-to-the-roof store with everything you can think of like Coca Cola machines, petticoats, Elvis licenseplates, Jukeboxes or Marilyn Monroe magnets... Bennies Fifties is open 7 days a week, so there's opportunities enough to take a dive in the past. It's a showroom and museum... Even when you not in a spending mood, it's a good idea to step inside this one-of-a-kind store. 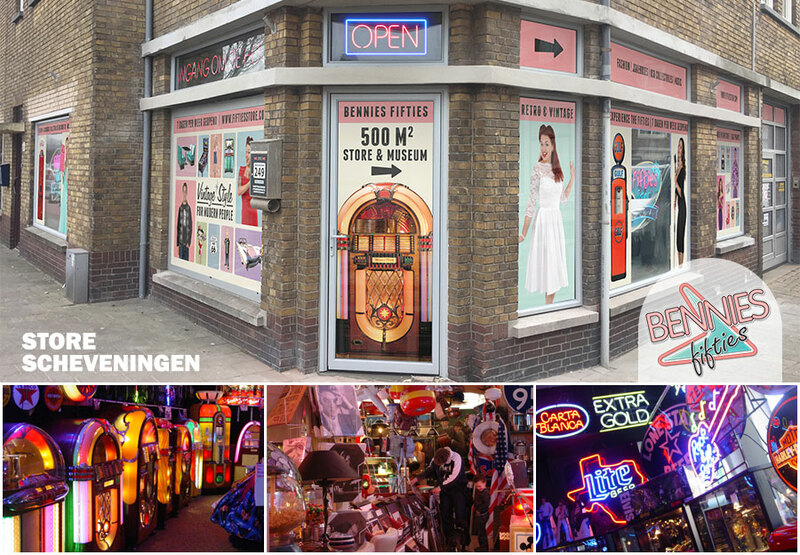 Discover the jukeboxes from the fourties, fifties and sixties or checkout the large collection of retro fashion. Bennies Fifties is open 7 days a week. Bennies Fifties is easy to reach by car or with public transport.